Are infrared halogen lamps your best option? Manufacturers of infrared saunas as well as experts in the field of incandescent light sources have kept up what seems like an endless debate: Which type of infrared heat will maximize the health benefits you receive from your infrared sauna? Many people favor halogen lamps for this purpose. There's no doubt that infrared halogen lamps are the most effective at generating the warmer light rays that are typical on the color spectrum. This part of the spectrum has been identified as below the level of red light, thus the name infrared. Unlike the more harmful ultraviolet rays (think sunburn), infrared radiation will not harm humans. In fact, you'll find infrared heaters put to good use in the neonatal units of hospitals, keeping premature babies safe and warm. Infrared halogen lamps work by exposing the tungsten element to a bit of halogen gas within the bulb. Their benefit over everyday bulbs is the iodine or bromine gas in the bulb and the chemistry that returns tungsten from within the bulb back to its filament. This process not only results in a bulb with a longer life, it also means the lamp emits light of a higher color temperature. The term "color temperature" is relevant to our notion that red is hot: Just as the hottest stars are blue or white and cooler ones like the Sun are yellow, the higher (cooler) color temperatures radiate light of a higher temperature. And this higher end of the color spectrum is marked as below the red end, thus the name infrared. Light waves vibrate at varying speeds throughout the length of the color spectrum and types of infrared light are identified by their associated wavelength. Near-infrared light runs at 0.76 to 1.5 microns and is known as IR-A; mid-infrared ranges from 1.5 to 4 microns, identified as IR-B; and far-infrared reaches 4 to 16 micron energy bands for IR-C radiation. There are, of course, different infrared sauna manufacturers and each one chooses its own type of infrared heater. Some infrared saunas heat with near infrared light, some with mid-infrared, some with far infrared and some use all three. The manufacturers that use primarily near infrared will be the first to tell you that near infrared offers many more benefits than far infrared. I am not a doctor and I'm not here to tell you which type is better. In any case, those who do their research on the web will find that even amongst themselves, doctors disagree. Dr. Sherry Rogers promotes far infrared as the most beneficial. But Dr. Lawrence Wilson purports that far infrared radiation is too close to microwave radiation, which is used in ovens and cell phones. Today you will find more and more medical professionals who express concerns that this type of radiation is dangerous for us. To further complicate this debate, you have to consider information from Philips, a major manufacturer of infrared halogen lamps. Their premiere product is the Vitae lamp and Philips promotes the fact that it emits a combination of the different kinds of infrared. This optimal balance across the infrared emission spectrum, says Philips, achieves the best skin penetration. 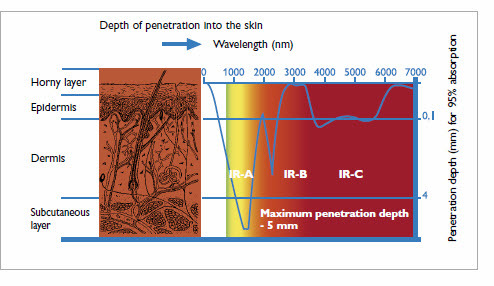 The combination of IR-A, B, and C rays penetrate as deep as 5 mm into the layers of the skin-below the topmost horny layer, through epidermis, into the dermis and almost all the way through the subcutaneous layer of skin. At this depth the heat is most effectively released, resulting in the warming effect that we seek in sauna therapy. Philips claims this radiated heat matches the true characteristics of the skin. You can compare radiation from the Sun, remembering that sunlight has a high level of harmful ultraviolet radiation, with the radiation from a Vitae lamp: The Sun's rays are 70% IR-A and 30% IR-B. The Vitae lamp emits 20% IR-A, 60% IR-B, and 20% IR-C.
As I said before, I am not a doctor. I cannot present any evidence of my own that one of the infrared types is more effective than the other two. However, I do put some stock into the fact that Philips is a worldwide company with a long history of achievements. In my eyes, this makes the Vitae lamp reliable. Whether you're talking about warranty support or the need to purchase replacement infrared halogen lamps, I believe in the Vitae product. Typically, an infrared sauna company does not disclose its heater's origin. This is problematic when a company folds-which does happen in this day and age. You can find yourself in the uncomfortable predicament of needing to get your malfunctioning heater replaced and not being able to do so. I am unable to tell you how the infrared sauna outfitted with Philips' Vitae heaters feels. If you've experienced sauna therapy with this type of equipment, I'd be eager to hear about it, please feel free to share your experiences using the form below. Want to share your comments on this page? Do you have some thoughts about this? Share it! Sunburn from infra red heaters?